Psychologists have told him he’s a psychologist. Philosophers have told him he’s a philosopher. Religious groups have invited him to speak. He had a cult following as a cartoonist. But, above all else, Tim Kreider is an essayist—one whose deft prose, uncanny observations, dark humor, and emotional vulnerability have earned him deserved comparisons to David Sedaris, Sarah Vowell, and the late David Foster Wallace (who was himself a fan of Kreider’s humor). 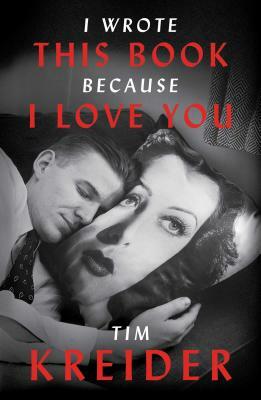 “Beautifully written, with just enough humor to balance his spikiness” (Booklist), I Wrote This Book Because I Love You focuses Tim’s unique perception and wit on his relationships with women—romantic, platonic, and the murky in-between. He talks about his difficulty finding lasting love and seeks to understand his commitment issues by tracking down the John Hopkins psychologist who tested him for a groundbreaking study on attachment when he was a toddler. He talks about his valued female friendships, one of which landed him on a circus train bound for Mexico. He talks about his time teaching young women at an upstate New York college, and the profound lessons they wound up teaching him. And in a hugely popular essay that originally appeared in The New York Times, he talks about his nineteen-year-old cat, wondering if it’s the most enduring relationship he’ll ever have. “In a style reminiscent of Orwell, E.B. White and David Sedaris” (The New York Times Book Review), each of these pieces is “heartbreaking, brutal, and hilarious” (Judd Apatow), and collectively they cement Kreider’s place among the best essayists working today. Tim Kreider has written for The New York Times, The New Yorker, The Week, The Men’s Journal, and Nerve.com. His popular comic strip, The Pain—When Will It End?, ran in alternative weeklies for twelve years and has been collected in three books by Fantagraphics. He is the author of two collections of essays, We Learn Nothing and I Wrote This Book Because I Love You. He divides his time between New York City and an undisclosed location on the Chesapeake Bay. "Tim Kreider's voice is never anything less than honest, smart, and hilarious; in I Wrote This Book Because I Love You he is even more mordant and empathetic than ever before. What a sad and beautiful book." "Tim Kreider's wonderfully frank, consistently funny essays reminded me at a time of spectacular doubt that there might still be a few men in America who are both weird and wise, equally friendly to cats and ex-girlfriends, and refreshingly willing to admit to flaws that come entirely free of vindictiveness and cruelty. In an age of widespread buffoonery, it's a pleasure and a relief to have Kreider restore a little faith." “Not only smart, but admission-against-interest honest—a winning combination, and rare." "Tim Kreider is one of my favorite living writers, no exaggeration...His wisdom is counterintuitive and therefore all the wiser; his humor is dark in ways that let light in where it's needed most. This isn't a book about one man's relationship to women as much as it's a chart of the collision course of human need in all its wrenching, perverse, gorgeous, hilarious forms. It's his best stuff yet." "Tim Kreider may be the most subversive soul in America and his subversions—by turns public and intimate, political and cultural—are just what our weary, mixed-up nation needs." "Tim Kreider's writing is heartbreaking, brutal and hilarious—usually at the same time. He can do in a few pages what I need several hours of screen time and tens of millions to accomplish. And he does it better. Come to think of it, I'd rather not do a blurb. I am beginning to feel bad about myself." "In a style reminiscent of Orwell, E.B. White and David Sedaris, an affable hero gamely bumbles through adventures rich with moments of fleeting profundity and moral reckoning...his depictions of the arc from ignorance to wisdom are reliably deft...Kreider is a curious and compassionate observer and a fantastic wit—I laughed to tears more than once. Though he excels at romantic comedy, the the essays that stray from that convention resound longer...pleasurable, well-wrought essays." "Kreider... writes like a smart, funny friend; his essays feel like late-night conversations that you don’t want to end." "Kreider isn’t solely a humorist; he’s also part philosopher, part psychologist, part poet. Paired with his depth of insight into the human condition and startlingly sharp observations, this intimate collection is as hilarious as it is poignant, as it explores what it means to love and be loved—even if it’s love shared with your 19-year-old cat. " "Kreider is...an inimitable American essayist. He reliably, intelligently, wittily states the hesitated-over, the unspoken, the perhaps, the after-last-call-drunken-theory-of-the-universe that actually might have been brilliant...His ideas are sometimes risky or incomplete, but I’ve almost never encountered them anywhere else; in style, he sits on the shelf between the quick humor of Dave Barry and the gentle, erudite persuasion of Virginia Woolf. When reading Tim Kreider, I feel as if he’s stated what’s already in my mind." "Much of the collection's strength comes from wry ruminations on his non-romantic relationships...Kreider's observations cut deep, sharply delivered in the midst of what he might sometimes call 'mush.' It's no surprise that David Foster Wallace declared, 'Kreider rules,' or that Kreider counts Richard Russo and Judd Apatow as fans. His precision and candor coexist like a just-sharpened razor slicing into soft fruit, sweet, lovely, messy and sustaining." "Come for the arresting cover, stay for the author's trenchant ruminations on his relationships with women...Like all the best essayists, Kreider finds words for the ineffable...he'll open your eyes to the many varieties of love."